After the blondies, another dish out from Gordon Ramsay’s Ultimate Cookery Course. Insort, three main ingredients to a delicious dish super easy to put together… All of a sudden, all these recipes with loads of cream, chorizo, stock seem a bit too baroque and convoluted. Tweaking a bit the methods you can also end up with a quasi-healthy dish. Meaning, using olive oil sparingly, skipping the butter and take out the fat from the chops. Well, sort of – or at least, this is want I want to believe because this combination is really outstanding. First, prepare the peppers. Take a large frying pan and put enough olive oil to cover its bottom. Heat until piping hot and then add the onion and peppers. Season with salt and pepper, add the sugar and sauté over a high heat until soft and coloured. Add the vinegar and let it bubble for a minute or two until it has reduced and the peppers are soft. Turn down the heat, add the tablespoon of extra virgin olive oil and cook for a further 2–3 minutes. Take the peppers out of the pan and set aside to infuse. Wipe the pan clean, ready to cook the pork. Place the cleaned-out frying pan over high heat and put enough oil to cover the bottom. Let it heat until piping hot and add the chops, garlic and thyme and fry for 2–3 minutes until coloured. Turn and fry for a further 2–3 minutes on the other side. Towards the end of cooking time, add 3 knobs of butter. Let it cook for a while, pressing the fat again the sides of the pan to render the fat. Squeeze the garlic out of its skin and place with the herbs on top of the chops. Transfer the chops to a plate, and rest for 5–10 minutes, spooning over the basting butter now and again. 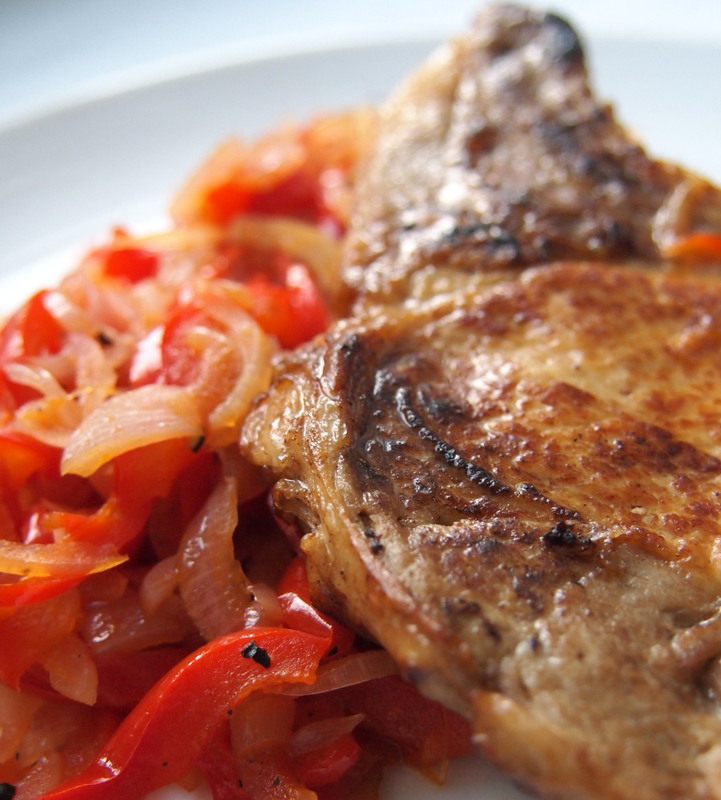 Serve the chops on top of the peppers with the resting juices.